Are you getting the best yield from your fruits and vegetables? Follow these 4 tips to make sure you're getting the most juice from your produce. Why? Overripe fruit, wilted greens, rubbery carrots, or mealy apples contain very little water, making it much more difficult to extract juice. Overripe apples will produce just an apple puree. From wilted greens you'll be lucky to get even a few drops of juice. And rubbery carrots can actually damage the juicer. 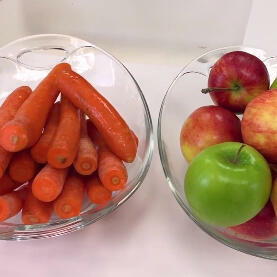 How to choose: Fruits and vegetables should be juiced as soon as possible after harveting or purchasing. For apples, choose firm varieties. Granny Smith are probably the best, followed by Gala, Red Prince, and Red Delicious. Pineapple and summer pitted fruits like peaches and plums are best juiced before they are fully ripe, while they are still firm. You might be able to save wilted greens or carrots by soaking them in cold water for a few hours. Why? When you push fruits and vegetables in too fast, you can force more produce into the juicing chamber than the juicer is capable of processing. 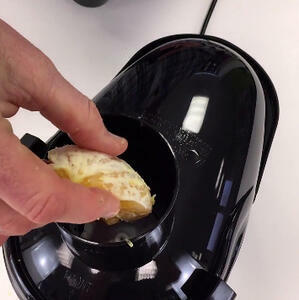 It means some parts will not be properly juiced, leading to wetter pulp as some of the juice backs up into the pulp. In extreme cases, especially with hard ingredients like beets, high pressure can build up in the juicing chamber, causing damage to the juicing screen. 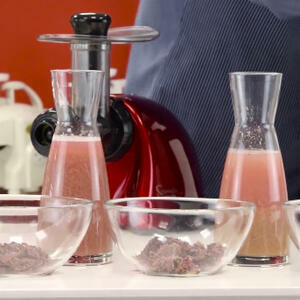 How to do it: Cut produce into the sizes recommended for your juicer. Don't be tempted by a wider feeding tube to shove in the largest carrots you can. Feed the ingredients one at a time, putting in the next piece when the previous piece has been processed. If juice starts to back up in the juicing chamber, it is a sign that you are overfeeding it. Let it run until the juice has drained from the chamber. Juicing one piece at a time will provide significantly higher yields. How to do it: Ideally, produce should be juiced in the following order: leafy greens first, soft fruits second, hard ingredients last. It is also effective if you are juciing carrots or beets to rotate in a piece or two between soft fruits or leafy green (except when using an Angel juicer). The hard ingredients will clean the soft materials out of the screen. Why? There are a few types of juicers. Generally speaking, the slower the rpm of the juicer, the higher the yield. If you plan to juice regularly, a slow-speed juicer is the best. Not only will it give consistently higher yield, but it will produce higher-quality juice with minimal oxidation and foam. Centrifugal juicers are often the most inexpensive, but they aren't effective with certain ingredients (like leafy greens) and tend to produce wetter pulp. 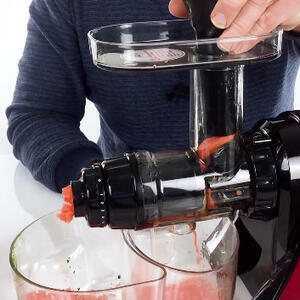 How to do it: Choose a low-speed cold press juicer for the best results. You can read about the differences in juicer technology in more detail here.